The Ukrainian government's "anti-terrorist operation" to overthrow the pro-Russian militants in the east of the country is... not going well. On Wednesday, six armored personnel carriers flying a Russian flag drove into the eastern Ukrainian town of Slovyansk and parked up in the central square. It's not immediately clear whether the militants strong-armed the vehicles from the Ukrainian army, or whether they were helped by defected Ukrainian troops. Neither option is a good sign for the Ukrainian government. One of the troops identified himself and those around him to the Associated Press as Ukrainian soldiers who had defected to the pro-Russian side. However, a senior lawmaker insisted that they had not defected but were carrying out a "false-flag" operation so that they could move about freely in the region, which is now controlled by pro-Russian militants. The Ukrainian security service announced on Wednesday that it had intercepted communications showing that Russian commanders in the eastern region had issued "shoot-to-kill" orders to their troops following the launch of the Ukrainian government's campaign to oust them from the region. The security service said these interceptions demonstrate that operations in the east are being "openly led by regular officers from the Russian military intelligence" who have issued these commands to kill Ukrainians. Moscow has repeatedly denied any involvement in the escalating crisis. Around 10 a.m. local time Wednesday a group of separatists backed up by seven masked gunmen dressed in camouflage stormed City Hall in Donetsk, the seat of the city's mayor and local council. It appeared that the pro-Russian group was allowing employees to leave freely, and witnesses saw workers running back and forth to vehicles attempting to save files and computers. Russian Foreign Minister Sergei Lavrov told reporters in Hanoi that Russia still planned to attend a meeting in Geneva aimed at resolving the crisis with U.S. Secretary of State John Kerry, European Union Foreign Policy Chief Catherine Ashton and Ukraine's acting foreign minister, Andrii Deshchytsia. 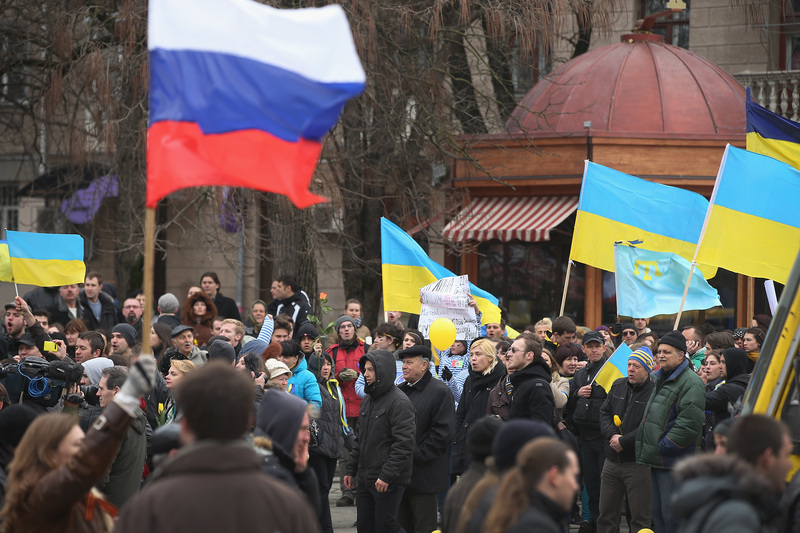 Instead of pulling support for the pro-Russian militants, as the U.S. and the E.U. have been urging Russia to do, Lavrov said that the only way for the Ukrainian government to resolve the crisis would be to give more power to each of the Ukrainian regions.